All Ryval regulators are precision engineered for single cylinder applications and designed for every day use. These regulators conforms to BS EN ISO 2503 with the gauges conforming to BS EN ISO 5171. 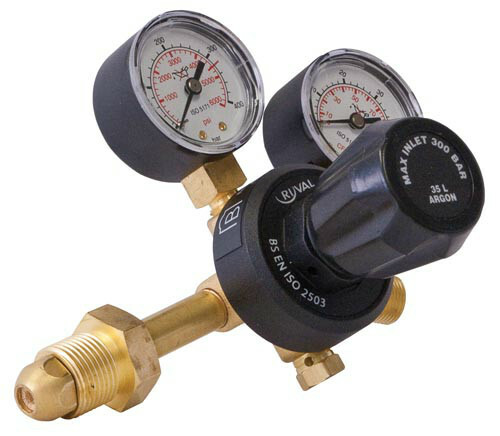 This two gauge regulator is designed for MIG/TIG welding, where the flow rate is indicated on the gauge up to 35 l/min. Postage is calculated by weight at £6 per 30kg if you are ordering equipment only. If you're ordering cylinders of gas the postage will be £40.00 for any delivery up to 30kg. This will increase by another £40.00 for every additional 30kg. Gases and equipment will be delivered within 2-3 working days. We deliver to over 90% of the UK including all of England, Wales and Northern Ireland. See our delivery map to check if we deliver to your area. Please note, certain areas of the UK may take one day longer. Orders placed on this website after 11am may not be processed until the next working day. Please retain all cylinder packaging, your cylinders will need to be sent back in this packaging when exchanging or returning. The delivery charges will automatically be calculated for you at checkout before you complete your payment.